Too often educators teach specific note taking strategies like Cornell Notes without teaching students WHY they work. 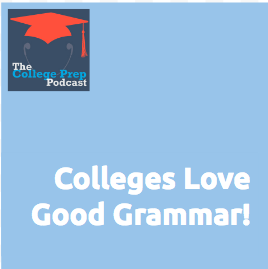 Tune in to hear Gretchen outline a straightforward approach to helping take better notes. Learn tips for how to put each of these steps into practice. At one point in this episode, Gretchen references the excellent graphic organizers at www.ThinkingMaps.com. 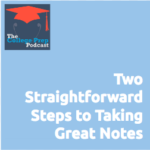 Click here to tune in to hear Gretchen outline a straightforward approach to helping take better notes. 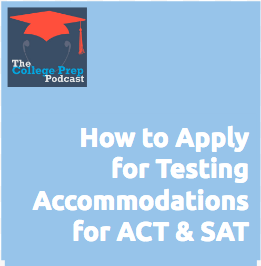 Click here to listen in as Megan gives you a detailed plan on how to manage your college admissions test. 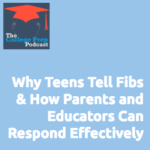 Teens tell fibs more often than parents wish. 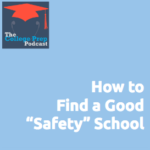 Some of them are pre-meditated and manipulative, but often they are a primal response to fear, especially in students with learning differences like ADHD. In this episode, Gretchen walks you through her notes from a great presentation she heard at last November’s International ADHD Conference. The presentation was called “Beyond Fight, Flight & Freeze: Is There a Fourth F?” and was presented by Barbara Brikey Hunter and Monica Hassal. For more information about these presenters, please visit Barbara Briskey Hunter’s LinkedIn Profile, and Monica Hassal’s website www.connectadhd.com. Also note: the conference where Gretchen heard them present was the 2018 International Conference on ADHD in St. Louis, sponsored by ACO, ADDA and CHADD. Click here to listen in so that you can learn how to respond effectively! 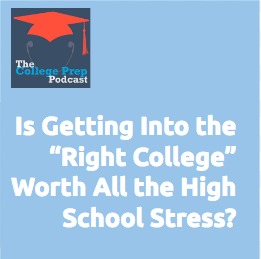 Many high school students feel pressured to choose a college major before they ever arrive in college — during the application process. 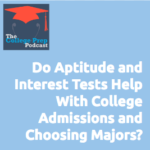 Megan walks us through whether it makes sense for students to take aptitude and interest tests to figure out what they want to study in college, and whether this helps with the college admissions process. 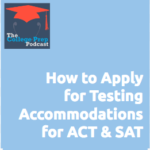 Listen in as Megan discusses aptitude and interest tests and whether this helps with the college admissions process. 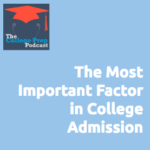 Are you surprised by what the “most important factor” in getting into college is? Gretchen was surprised when Megan told her that it’s the high school transcript. Click here to listen in to learn more about your transcript too! At a recent speaking gig about how to tackle procrastination, students asked Gretchen how to make school work fun! They seemed incredulous that “fun” is even a worthwhile pursuit when it comes to school. Three practical actions to make your experience of class less boring. 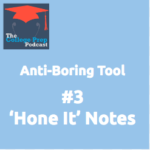 Click here to Listen in as Gretchen provides a few thoughts about how to take responsibility for making your learning by “anti-boring” no matter how bored you really feel! 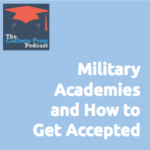 Military academies require a lot of extra work to apply to, but it can be worth it for the high quality free education they provide if you get in. I have begun to listen to you at the end of this summer because I wanted to improve my act and sat score although I haven’t taken the sat. The start of this summer I’ve had the motivation to attempt and get into a military academy as in the naval academy and Air Force etc. I’ve found the basic requirements to get into those types of schools and have been working my way too achieve those. I wanted to ask if there is anything you guys know that will help me have a better chance to get accepted. My current act score is a 24 but haven’t taken it in a while and am about to go into a class for it. My GPA is around a 3.7 but have a lot of upcoming AP classes and am determined to get all A’s. Lastly, I feel I have an edge up because by the end of high school I will have studied Chinese for 8 years with two AP Chinese classes. 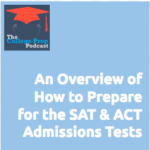 I wanted to know what you guys think and I respect your drive to better students lives by providing them quality information. Thank you!!! 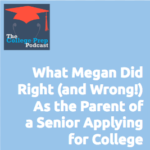 Listen in as Megan answers a listener question on this topic! …but how do you test yourself in new and interesting ways so that you don’t bore yourself to tears? 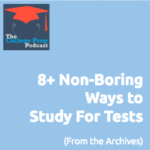 Tune in for Part 4 of the Anti-Boring Summer Series, where Gretchen walks you through how to create quizzable study tools, so you have lots of choices for how to test yourself . 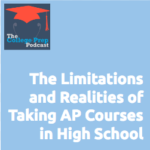 Don’t forget to click here to hear Part 4 of the Anti-Boring Summer Series, where Gretchen walks you through how to create quizzable study tools! Is studying tedious and boring? Use the Study Senses as a simple checklist for how to engage your brain while learning, so that you learn more in less time. 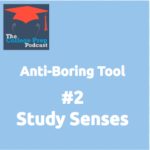 Tune in for Part 2 of the Anti-Boring Summer Series, where she walks you through a simple model for how to mix up your studying so you’re processing information in multiple ways. 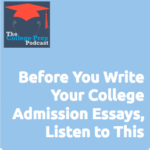 Essays are an important component of college applications, but most people– students, parent, and even educators– have little idea what a winning essay looks like or how to write one. Don’t forget to listen in as we help you get started and share advice from some colleges.